Now more than sixty years following her death in the Clermont-de-l'Oise psychiatric hospital, the paintings of Séraphine Louis a.k.a. Séraphine de Senlis are finally on display in galleries around the globe. 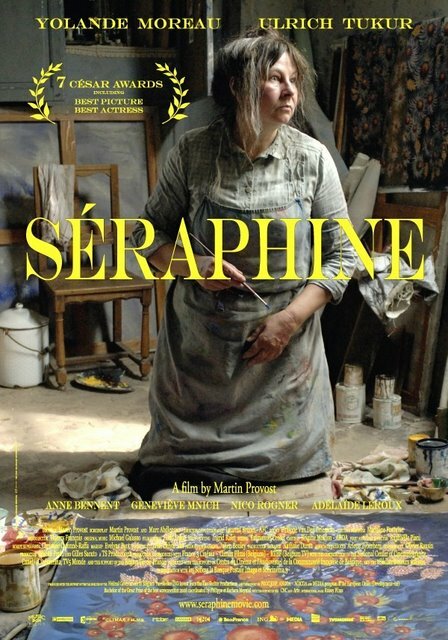 Yet when looking back on the life of the French maid turned painter in writer/director Martin Provost's seven-time Cesar award winning film Séraphine, I couldn't help but become overwhelmed by the amount of mystery and contradiction that pervaded throughout her time here on Earth. 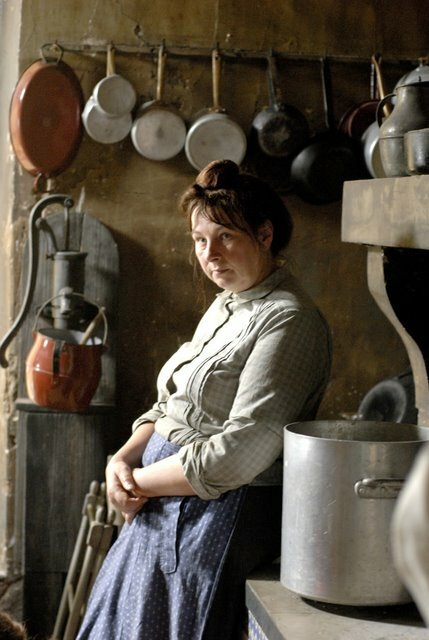 Although the lives of artists are seldom happy (but then again as Tolstoy warns, "Happy families are all alike," and that certainly doesn't make for good cinema), startling mysteries as well as mental illness are a recurring theme of artistic biopics from Camille Claudel to Artemisia. Therefore it's only fitting when Provost discusses his movie in the press notes created for the Music Box Films release, that he quotes Picasso's ominous yet accurate assertion that, "If I don't paint, I'll get sick, I'll die," that helps shed some light on one possible mystery in particular. Puzzlingly however, is the fact that although Séraphine spent the last ten years of her life away from canvases and brushes while instead confined to a mental institution, Séraphine's first and indeed most enthusiastic and influential supporter-- Picasso's first buyer and Rousseau discoverer German collector Wilhelm Udhe (Ulrich Tukur)-- listed the death of the talented yet deeply troubled woman as 1934 in his autobiography instead of 1942. Why he did so has always been something of a controversy but perhaps the answer can be found in something as straightforward and logical as those words of Picasso's. Simply put-- without a paintbrush, paints or the means to somehow creatively make sense of the visions and voices of those such as the guardian angel who told Séraphine that she needed to draw and later to paint-- the woman in fact was essentially as good as dead. However this conclusion is only one possibility and furthermore, it's one that's discovered in the research as questions and answers aren't of the utmost importance to the filmmaker in Martin Provost's vague, airy, slow-moving, and rather contemplative film which is both Séraphine's hypnotic strength and its yawn-inducing weakness. 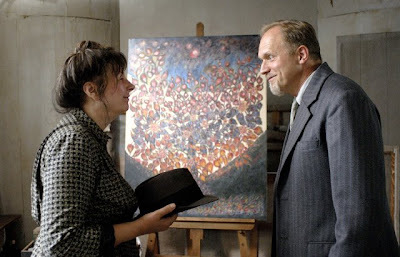 For, fitting to the "naive" or naturalistic style of Séraphine's artwork, Provost's film-- that's gorgeously lensed by cinematographer Laurent Brunet (AFC) and heightened by In the Mood for Love and Chungking Express composer Michael Galasso's original score-- dedicates itself to establishing the mood and setting for the artist's life, ultimately painting Séraphine via broad strokes and letting the actors do the rest. And with this talented cast, it's definitely the right decision to make as it's led by Amelie actress Yolande Moreau as Séraphine and The Lives of Others' star Ulrich Tukur as Udhe and together they never make a false step. 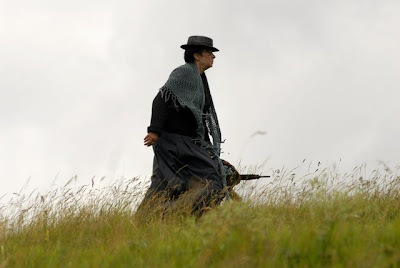 However, it's in the surprisingly Cesar award winning screenplay which-- although comprised of any historical documentation that could be found regarding Séraphine's life-- wears on the patience of the viewer as the film meanders. Indeed, its major flaw is in the lack of focus right off the bat in taking a good thirty to forty-five minutes before we finally begin to grasp just who the two people are in the scheme of the art world. 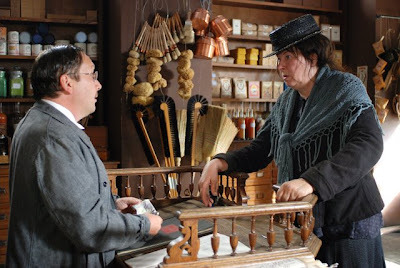 In fact, it works better as a character study as the film develops and we become more acquainted with the strange relationship of the nearly destitute female maid whom Provost described as representing "at the time what was the lowest on the social ladder" and her foreign, gay, and lonely employer. And sadly, although it's a lovely piece overall (despite the overly long 125 minute running time)-- and as a woman I feel we can never have too many films about female artists since there's too few as it is-- Provost ultimately bogs down the work with some overly symbolic, dull, and pretentious sequences early on in Séraphine. And building off the plodding set up with the concluding act of the requisite scenes of hysteria that ultimately bookend the movie, I was left with a sense that I was no closer to understanding the artist or her work than I had been before the film began. Additionally, this is coupled with the sense that ultimately we're faced with yet another movie about mystery and contradiction in the lives of artists as so many questions are raised in the movie that aren't answered. However, while this is fitting and inspiring not to draw a clear conclusion when faced with a few aspects of the individuals' lives, more often than not, it's frustrating that even the most basic ones take awhile to try and wrap your head around. Yet, the question I was most troubled by when the picture ended was what the filmmaker's aim was in telling the anticlimactic story in the first place to perhaps see where it may have gone wrong. And this is especially worrisome because the harsh reality is that-- minus the press notes and more research-- I'm not sure I would've been able to connect the dots or understand what was deemed so significant about the storyline. For much like an artist without a brush or a canvas who has an incredible idea for a work but can't quite figure out just how to express it, I understood Provost's passion but overall felt that the film was missing a central dilemma other than just slowly watching Séraphine self-destruct.